Imping is a feather splicing technique where a whole feather that matches the broken one is cut to fit with the other feather making a whole feather. The feather shaft is then plugged or splinted internally with something light but strong like thin wire and then glued to the broken feather, thus creating the whole feather. 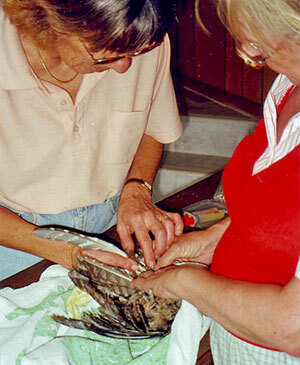 My friend Bev Middleton and I decided to imp all the flight and tail feathers onto a tawny frogmouth that had been badly burnt in bushfire back-burning. First we obtained feathers from a similar sized dead bird and arranged them very carefully to ensure that each feather was correctly used in the replacement (every single feather in a bird’s wing is slightly different and a perfect match is essential). 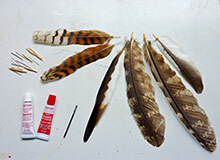 The photo below-right shows some of the materials we used to complete the task of imping with some of our pre-pared feathers. 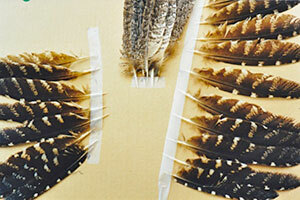 A small drill bit is used to ream out the centre of the feather. 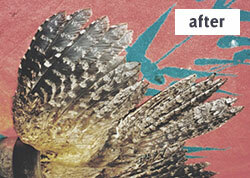 Thin wire pins were used for small feathers and trimmed tooth-picks for larger ones. Quick drying araldite is essential but great care must be taken to ensure it does not coat the bird’s feathers – this is a very fiddly procedure but a very important one. 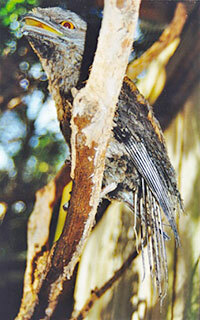 Our tawny was later placed in a flight aviary for 10 days after the operation. And was then successfully released back to its territory. We were both very proud of ourselves and subsequently did many imping procedures between us and were even filmed by the ABC TV working on another tawny.